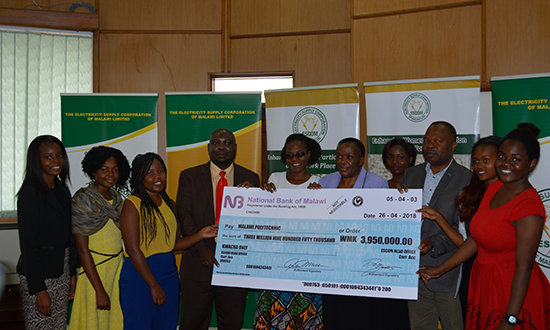 The Electricity Supply Corporation of Malawi Limited (ESCOM) has awarded 8 high performing female electrical engineering students from the Malawi Polytechnic with a scholarship worth MK3, 950, 000.00 to cover their tuition fees for the 2018/2019 academic year. Speaking at the scholarship handover ceremony, ESCOM’s Director of Distribution & Customer Service, Dr. Alfred Kaponda, congratulated the girls while regretting the low participation of females in technical fields such as engineering. At ESCOM alone, out of 164 engineers 11 are females while out of 315 technicians 13 are females. “ESCOM has, therefore, put in place policies, programs and practices to contribute to the achievement of Gender equity and equality in the organization and the energy sector. The scholarship to female engineering students is one of such programs.” Said Kaponda. Speaking on behalf of the Malawi Polytechnic Engineering Department, Dean of Engineering Dr Gregory Gamula conceded that engineering is indeed a male dominated field. However, the University is striving to ensure that there is a 50:50 representation of male and female students in its education programs. He further commended ESCOM for collaborating with the University in improving female involvement in technical fields. “It is such collaboration between the industry and academia that will enable us to fill the gaps that are there of female participation in technical fields.” Said Gamula. One of the female students, Tionge Nyirenda, who was receiving the award for the second year running, said that she feels empowered and equipped by the internship program which is part of the scholarship. “The internship has given me practical experience and equipped me with skills that I would not have gained otherwise. I now feel more equipped and ready for the world.” Tionge said. ESCOM launched the university scholarship program in 2017 to promote the involvement of female students in technical fields. To date, 14 female students from the Malawi Polytechnic and six students from Malawi University of Science & Technology (MUST) have benefited.